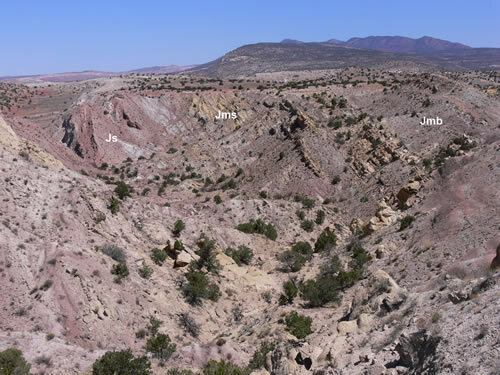 A spectacular, eroded anticline and syncline pair lies within the Ojito Area of Critical Environmental Concern near the village of San Ysidro in north-central New Mexico. Figure 1. Index map showing the location of the San Ysidro folds. Drive north on I-25 from Albuquerque to Bernalillo and turn west on US 550 (Exit 242 off of I-25). At mile marker 21 on Highway 550, which is about 2 miles east of San Ysidro, turn left (west) onto Cabezon Road, a well-marked gravel road with a green street sign; immediately take the left fork. The folds can be accessed via a trail system (White Mesa mountain bike trails) that originates in a parking lot located about 4 miles west of the Highway 550/Cabezon Road intersection on the north side of the gravel road. The San Ysidro area lies near the intersection of four significant geologic features, including the mildly deformed Colorado Plateau to the west, the Laramide-age (75 to 55 million years old; Pazzaglia and Kelley, 1998) Sierra Nacimiento uplift to the north, and the late Oligocene to Miocene Rio Grande rift to east. The northeast-trending Jemez lineament, characterized by young volcanism, cuts across all three geologic provinces. The <15 million year old Jemez volcanic field is visible to the northeast, the 2 to 3 million year old Puerco Necks, including Cabezon Peak, are located just to the west, and the 1.5 to 3.3 million year old Mount Taylor volcano can be seen on the skyline to the west. Figure 2. Generalized stratigraphy of the San Ysidro area. Late Triassic to Early Cretaceous sedimentary rocks are well exposed in the folds (Figure 2). 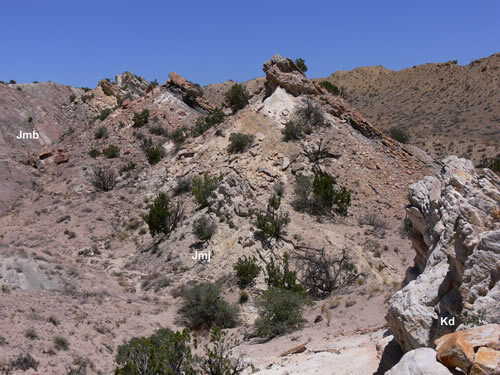 The oldest unit, which is found in the core of the anticline, is the Painted Desert Member of the Petrified Forest Formation of the Chinle Group (Figure 3). These red to green siltstones and mudstones were deposited on the floodplain of a large, west to northwest flowing river system about 205 to 210 million years ago. Figure 3. View toward the north of the east limb of the anticline. 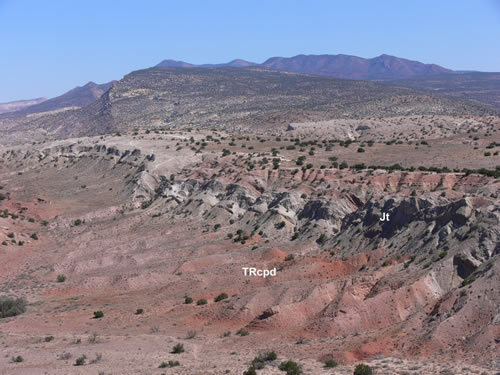 TRcpd is the Triassic Painted Desert member of the Petrified Forest Formation (Chinle Group) and Jt is the Jurassic Todilto Formation. The mountains on the skyline are the Sierra Nacimiento. Photograph taken by Richard Kelley. The Middle Jurassic Todilto Formation lies directly on the Chinle Group in this area (Figure 3). The Middle Jurassic Entrada Sandstone, an eolian deposit that is commonly preserved between the Todilto Formation and the Chinle Group on the Colorado Plateau, pinches out just north of the area. The Todilto Formation is composed of two units, a basal laminated shale and limestone (Mesa Luciano Member) and an upper gypsum deposit (Tonque Arroyo Member). The White Mesa mine, which is visible to the northeast of the overlook of the anticline, extracts gypsum from the Tonque Arroyo Member to make drywall for houses in the Albuquerque area. The Todilto Formation was most likely deposited in a salina (Lucas et al., 1985); in other words, in a moderately deep, oxygen-poor, body of saline water that was isolated from the main body of the Jurassic ocean by a barrier. First, limestone precipitated from the evaporating sea water. Anderson and Kirkland (1960) noted that basal limestone was deposited in thin layers, with each layer consisting of limestone, clay, and dark organic material. Each layer, or varve, represents a one-year cycle related to seasonal variations in runoff, water temperature, and abundance of lake organisms. Anderson and Kirkland (1960) carefully counted the varves and found that it took 14,000 years for the basal laminated limestone to accumulate. Later, as the saline waters of the salina became more concentrated by evaporation, gypsum precipitated. The Todilto Formation is approximately 159 million years old, based on fossil evidence (Lucas et al.,1985). Thus approximately 45 million years of Earth’s history is missing at the contact between the Chinle Group and the Todilto Formation. Figure 4. View of the east limb of the anticline, looking north toward the Sierra Nacimiento. Js is Jurassic Summerville Formation, Jms is the Salt Wash Member of the Jurassic Morrison Formation, and Jmb is the Brushy Basin Member of the Morrison Formation. Photograph by Richard Kelley. The Todilto Formation grades up into the Jurassic Summerville Formation, a maroon mudstone and pinkish-tan, poorly cemented sandstone (Figure 4) deposited on an arid coastal plain (Lucas et al., 1998). Pedogenic carbonate is common in the maroon mudstone. River channel sandstone of the basal unit of the Jurassic Morrison Formation, the Salt Wash Member, form the distinctive gold-colored, west-dipping beds on the eastern flank of the anticline (Figure 4). The Salt Wash Member consists of alternating beds of gold-yellow, cross-bedded sandstone and red to green siltstone. The sandstone contains abundant concretions. The sandy beds give way to interbedded salmon-pink to pistachio-green siltstone with thin river channel sandstone (Figure 4 and 5). This distinctive unit is the Brushy Basin Member of the Morrison Formation. Dinosaur bones and highly-polished gastroliths are commonly preserved in this unit. Some bone fragments can be examined near the base of the sandy stream channels near some of the mountain bike trails. Radiometric dating of ash beds (40Ar/39 Ar on sanidine; Kowallis et al., 1998) in the Brushy Basin Member in Utah and Colorado yields ages of 148 to 150 million years for this unit. The top of the Morrison Formation is capped by the white Jackpile Sandstone Member (Figure 5), which is another river deposit. Figure 5. East limb of the anticline exposing the Brushy Basin Member and the Jackpile Member of the Morrison Formation (Jmb and Jmj) and the basal unit of the Dakota Formation (Kd). Photograph by Richard Kelley. The youngest Mesozoic units exposed here are Cretaceous coastal plain, shoreline, and marine units that were deposited along the western margin of the Western Interior Seaway ~93 to 125 million years ago. A chert and quartzite pebble conglomerate deposited on an irregular surface marks the base of the Cretaceous Dakota Formation, which is composed of six units here. Five of the units lie in a continuous sequence, while the topmost unit is separated from the rest by a tongue of the Mancos Shale (Figure 2). The basal unit of the Dakota Formation, the Encinal Canyon Sandstone is a thin-bedded, cross-bedded, gold-colored sandstone interbedded with black shale and carbonaceous beds (Figure 5). The Oak Canyon Member is a shale with plant debris fossils interbedded with a few thin bioturbated sandstone beds. The sandstones are locally cross-bedded, but, in general, the sandstones were intensely burrowed by marine organisms living in the shallow water along the shores of the Western Interior Seaway. Burrows are structures in sedimentary rocks formed by organisms digging or moving through sediment when the sand or mud was soft; organisms burrow through sediments seeking shelter, protection, or food. Bioturbated, gold-colored Cubero Sandstone overlies the Oak Canyon Shale and is overlain by black marine shale of the Clay Mesa Member. The orange-yellow Paguate Sandstone is a bioturbated, ripple-marked sandstone on the Clay Mesa Member of the Dakota Formation. A thin tongue of Mancos Shale sits on the Paguate Sandstone and below the < 2 m thick Twowells Member of the Dakota Formation. Starting about 75 million years ago, New Mexico, as well as most of the western United States, was affected by a compressive mountain building event known as the Laramide Orogeny. The Sierra Nacimiento to the north of San Ysidro was uplifted along a thrust fault zone on the west side of the range (Woodward, 1987; Woodward and Ruetschilling, 1976; Cather, 2004; Pollock et al., 2004). To the southwest of San Ysidro, the fault zone dies out and Laramide compression was accommodated by folding (Figure 6). The area has since been disrupted by extensional normal faults related to the Rio Grande rift (Woodward and Ruetschilling, 1976) . Figure 6. DEM (digital elevation model) of the San Ysidro area. 1 marks the approximate location of the overlook of the anticline. Modified from Pazzaglia et al. (1999 ). Anderson, R.Y., and Kirkland, D.W., 1960, Origin, varves, and cycles of Jurassic Todilto Formation, New Mexico: Bulletin of the American Association of Petroleum Geologists, v. 44, p. 37-52. Pazzaglia, F.J., and Kelley, S.A., 1998, Large-scale geomorphology and fission-track thermochronology in topographic and exhumation reconstructions of the Southern Rocky Mountains, Rocky Mountain Geology, v. 33, p. 229-257. Pazzaglia, F.J., Woodward, L.A., Lucas, S.G., Anderson, O.J., Wegmann, K.W., and Estep, J.W., 1999, Phanerozoic geologic evolution of the Albuquerque area, in Pazzaglia, F.J., and Lucas, S.G., Albuquerque geology: New Mexico Geological Society Guidebook, 50th Annual Field Conference, p. 97-114. Pollock, C.J., Stewart, K.G., Hibbard, J.P., Wallace, L., and Giral,, R.A., 2004, Thrust wedge tectonics and strike-slip faulting in the Sierra Nacimiento New Mexico: New Mexico Bureau of Geology and Mineral Resources Bulletin 160, p. 97-111. Woodward, L.A., 1987, Geology and mineral resources of Sierra Nacimiento and vicinity, New Mexico: New Mexico Bureau of Mines and Mineral Resources, Memoir 42, 84 p.
Woodward, L.A. and Ruetschilling, R.L., 1976, Geology of the San Ysidro quadrangle, New Mexico: New Mexico Bureau of Mines and Mineral Resources, Geologic Map 37, scale 1:24,000.